You can take the tour any time throughout the year. We are comparing Eiffel Tower 2nd Floor Skip line tickets Prices from leading ticket suppliers and Try to find you Cheap tickets prices on the market. The Eiffel Tower: Second Floor Priority Access is the ticket that entitles you to get a comprehensive overview of the world-famous Eiffel and take part in a guided tour. As you get yourself acquainted with the Iron Lady of Paris, you will learn interesting anecdotes, fun facts and entertaining stories about this once frowned upon landmark. While getting around, you will enjoy amazing panoramic views of nearby points of interest, including Trocadero and Champ de Mars. On the second floor, the unique perspective of the cityscape awaits you, with the Arc de Triomphe, Notre Dame Cathedral, Scare Coeur Basilica and the Pantheon visible in the distance. This great tour is ideal for every people who are interested in the background ofof the most famous monuments in the world. Your Experience With Eiffel Tower 2nd Floor Skip line tickets? 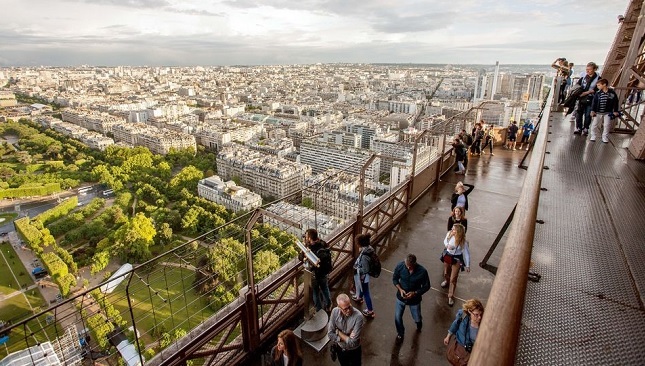 With this convenient ticket, you will skip the notoriously long lines to the Eiffel Tower and benefit of the priority access to the 2nd floor. You can listen to your knowledgeable tour guide as they teach you about the popular monument, its history and interesting facts involving the tower and the Parisian Citizens. You will also have a pleasure to experience something quite extraordinary - to seemingly drift in the air as you stand on the transparent glass floor of the 1st level. Without a doubt the sweeping views of Central Paris and it’s surrounding area will amaze and astound. Have the option to purchase a ticket for the 3rd level of the Eiffel Tower and observe the surrounding region of the French capital. What Eiffel Tower 2nd Floor Skip line tickets Includes? The ticket entitles you to access the 1st and the 2nd floor of the iconic Eiffel Tower. Also, you benefit from the fast-track entry to the tower, skipping long lines that start to form during early hours of the morning. For the price of the ticket, you get a guided tour of the Eiffel Tower that reveals many interesting stories and facts about this premium attraction in the French capital. With this priority entrance ticket, you are free to remain in the tower as long as you wish after the guided tour ends. The second floor of the Iron Lady is the best for observing the main landmarks and attractions of Paris. There are restaurants on the 1st and the 2nd levels of the Eiffel Tower. Travelers Reviews about Eiffel Tower 2nd Floor Skip line tickets? Travellers have a great opinion of this activity; they rated their experience with 4.4 out of 5-stars on Get Your Guide, and with 4.5 on TripAdvisor and Viator. They underline that views from the 2nd level are extraordinary and that the guide led the tour to a high standard. Reviews of the majority of participants imply that the activity is great value for money. Both printed and mobile vouchers are valid for this tour. Refunds and cancellation policies depend on your tour provider. Tickets cannot be modified nor exchanged. You need to arrive at the meetin g point 15 minutes in advance. If you arrive late, you won't be able to enter the tower ans tickets will not be refinded. Priority access is available only for the 2nd level. Meeting Point: History Group Shop, 38 Avenue de la Bourbonnais address.